Designed primarily for suburban applications, this robust tank comes in a range of colours to suit your exterior decor. These tanks are designed for above-ground installations on a solid, flat base (concrete or boxed and sanded). Capacities and dimensions are approximate due to variable shrinkage during the manufacturing process. Tanks are supplied with a leaf strainer, 90mm overflow outlet, brass outlet with ball valve. A lower inlet height is available. 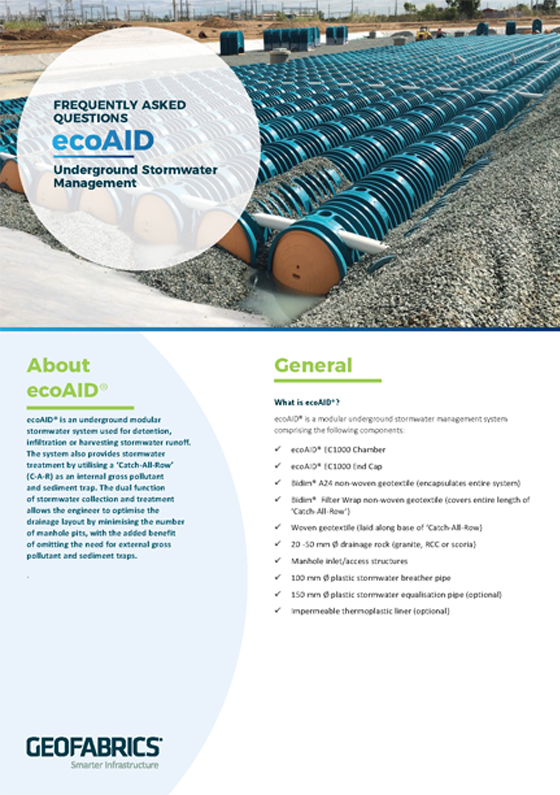 Ecoaid is an underground modular stormwater system used for detention, infiltration or harvesting stormwater runoff. The system also provides stormwater treatment by utilising a “Catch-All-Row” (C-A-R) as an internal gross pollutant and sediment trap. The dual function of stromwater collection and treatment allows the engineer to optimise the drainage layout by minimising the number of manhole pits, with the added benefit of omitting the need for external fross pollutant and sediment traps. The Ecoaid chamber system can provide both primary and secondary treatment through the removal of gross pollutant and sediment via physical screening, sedimentation and filtration techniques. The Ecoaid system is easily maintained from street level via the C-A-R utillising a Jet-Vac cleaning unit with a hght pressure hose. 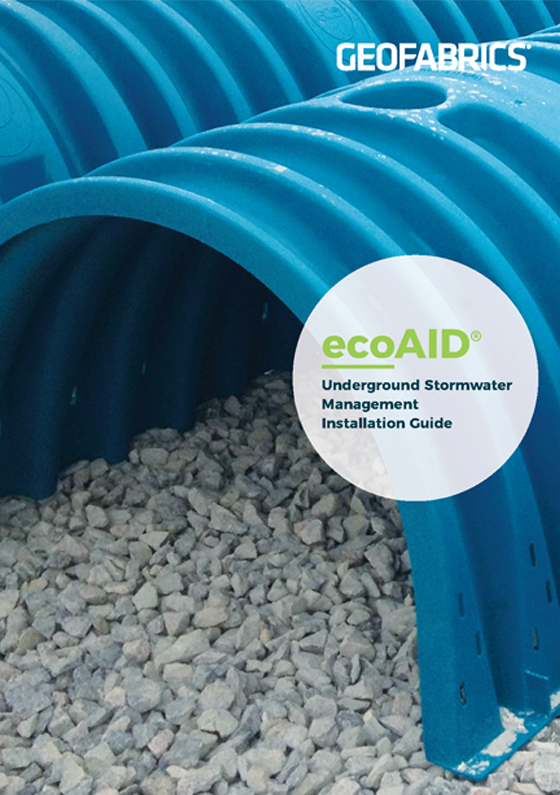 Ecoaid is an Exceptionally strong and robust water storage and treatment system that is capable of being used under public roads, car parks, sports fields and public open space. This provides the engineer with opportunities to save valuable land space and protect natural waterways from the damaging effects of pollution from both new and existing developements. The Ecoaid system is manufactured in Australia and is a provern cost effective to imported systems. Local manufactured not only supports the Australian manufacturing industry, it also provides shirter product lead and a financial boost to the local economy. 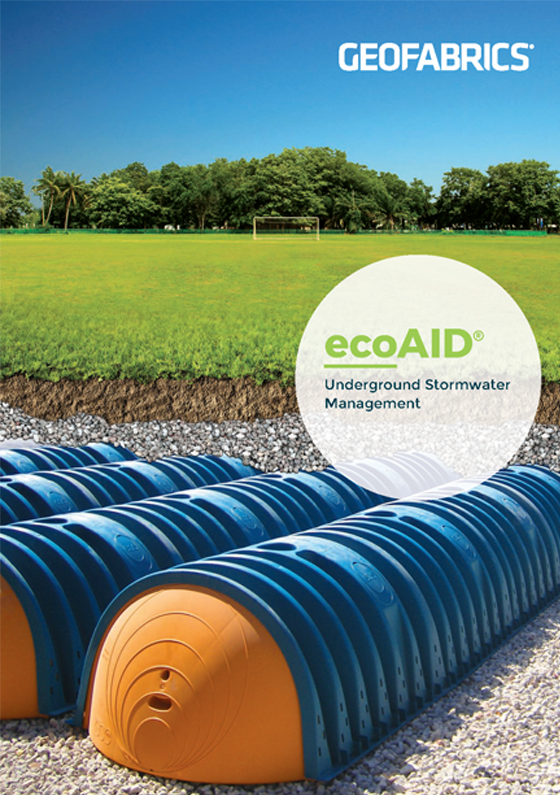 Ecoaid is an underground modular stormwater system used for detention, infiltration or harvesting stormwater runoff. The system also provides stormwater treatment by utilising a “Catch-All-Row” (C-A-R) as an internal gross pollutant and sediment trap. The dual function of stromwater collection and treatment allows the engineer to optimise the drainage layout by minimising the number of manhole pits, with the added benefit of omitting the need for external fross pollutant and sediment traps. Catch-All-Rows are simply rows of chambers with stormwater inlet pipes that have been laid upon a base filter (WP40 1.33 m wide and cover filter (Filterwrap). The Catch-all row is a treatment device serviced via inspection/ cleaning ports and environmental contaminants etc. are deposited by sedimentation or filtered from the surface water and are retained in this row, where they can periodically be cleaned out. 1. Before plascing any chambers or end caps on the Catch-all row, roll out the WP-40 Catch-all base filter on the stone bedding layer. 2. Position Catch-all row chambers and end caps. Ensure that some of the WP40 Catch-all base filter extend either side of the chamber feet all the way along the row. 3. Cover this row the grey Filterwarap Catch-all cover filter geotextile. Ensure that the three slots on each corrugatiob of the chamber are covered by this geotextile and it extends fully over each end cap. 4. Insert the Lateral pipes and inspection port risers through a hole or cuts made in the Catch-all cover material.